Close to Milau are the Roquefort Caves; an extraordinary geological feature, formed by nature after the landslide of the Combalou mountain. 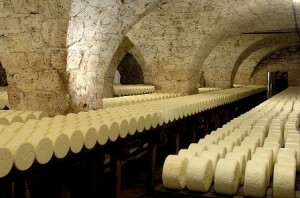 These high vaulted caves, ventilated by natural draught passages, are where thousands of Roquefort cheeses are nurtured. Although similar cheeses are produced elsewhere, European law dictates that only those cheeses aged in these natural caves can bear the name Roquefort. The caves can be visited all year round and offer an opportunity not only to visit the underground labyrinth, but to sample delicious, fresh Roquefort!